What can LeadCloak do for you? LeadCloak is a powerful cloaker that you can use to easily cloak various ad networks to get targeted traffic to your web sites and offer pages. LeadCloak is updated hourly with information on bot IPs, fingerprints and so forth to stay one step ahead of the game. LeadCloak is equipped with accurate geolocation databases so you can target your campaigns with precision. Our systems are designed to identify and block visitors that do not have a real human touch, which includes, but, is not only limited to bots, crawlers, manual reviewers, and so on. 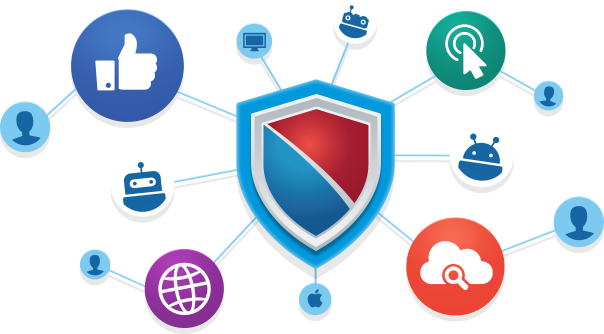 We also identify IPs that belong to virtual private networks (VPN), anonymous & private proxies, content delivery networks, data centers, web hosting IPs, and lots of unnatural visitors. LeadCloak offers a built-in URL rotation features that allow you to easily A/B split-test your web pages. You can match your traffic target locations to distinct landers, and match traffic sent from different devices to your web pages as well. How is LeadCloak different from other filtering tools? Bye-bye Cloud! We own our own hardware and infrastrucure that delivers faster response times. LeadCloak is founded by an OG, an IM'er with a Computer Science background. He has run his own 7-figure campaigns and built the original platform back in 2007. We take pride in our software, and we like to stand behind our products with a stellar support. LeadCloak has an easy-to-use interface. You do not need any technical skills to get up-to-speed, and to use LeadCloak. LeadCloak performs various checks behind-the-scenes. Your visitors won't know what tests are being performed to test them. Use one of many LeadCloak's databases that are constantly updated to block certain visitors. Our blazing fast infrastructure performs the evaluations within milliseconds that maximizes visitor retention and low bounce-rates! Utilize our user interface to see unwanted traffic, collect information on them, and then permanently exclude them out of all of your incoming traffic! Already know which visitors that you would like to block? Upload your lists and begin blacklisting them immediately! LeadCloak utilizes paid databases to optimize accuracy when discovering information like the geographical location of your customers. Total transparency. Learn just how many people are being blocked and why. We can process up to a billion visitors every day! Our system along with the network is also completely redundant to reduce downtime in the event of outages. Join the many happy users whom are already employing the most innovative visitor filtering platform. Spy tools, competitions, proxy/VPN customers, scrapers, bots and many other unwanted visitors. No technical skills needed. Our quick, intuitive setup procedure will have you up and running in moments! Questions? Click here to contact us instead. What devices does LeadCloak support? Certainly! Real-time reporting is considered fundamental to a cloaker and a tracker. Our powerful database clusters allow you to view your traffic details in real-time. Additionally, you can view your campaigns' statistics, and download .csv reports. All in real-time. Do you support integration with 3rd party trackers such as Voluum, Prosper, Imobi, CPVLab etc.? Yes, and you can also configure dynamic parameters passing with LeadCloak. How often does LeadCloak get updated? LeadCloak is updated once every 30 minutes. We release periodic updates to keep your defenses powerful. As our client, you won't have to shell out extra for upgrades. What niches can I promote with LeadCloak?